The ability of the atmosphere to pass electromagnetic wave depends on the mass of air, traced rays, as well as water vapor and dust in the air. Transparency of the atmosphere varies for different wavelengths of radiation and the greater the smaller the absorption and scattering in the atmosphere. Transparency of the atmosphere can be characterized by a transmission coefficient equal to the percentage of radiation that passes through the atmosphere at the steep fall-rays, or so-called turbidity factor, which shows the extent to which the transparency of the real atmosphere in these conditions is different from a perfectly clean and dry (perfect) air. The atmospheric transparency at various points of the globe is not the same. The most transparent air into the pole regions because there it contains the smallest amount of dust and moisture. Changes in humidity and dust content of air in this paragraph for the year determines the annual variation of atmospheric transparency at this point. 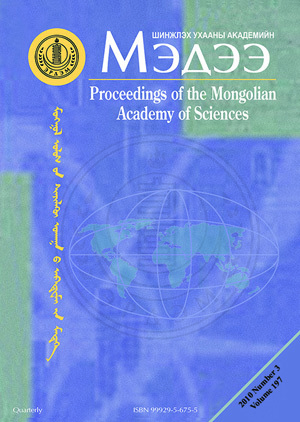 In this paper we define the atmospheric transmission coefficient from measurements of solar UV radiation in different parts of Mongolia.